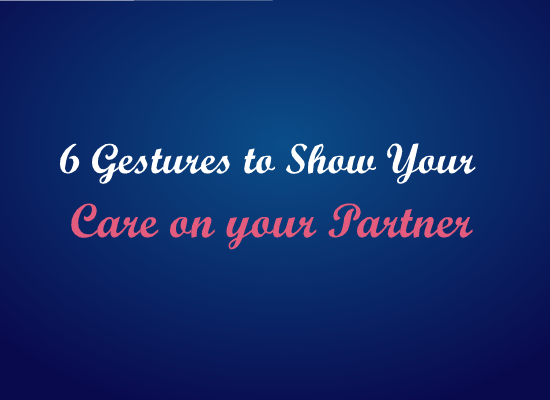 Without using any words you can show your care on your partner by using these Gestures. 1. Be respectful. Show up to dates on time. Don’t leave them waiting around. Value their time and the fact that they have a life of their own. 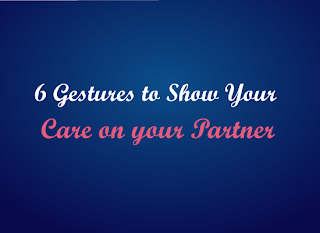 It seems like a little thing but being respectful shows that you value them as a person and that you view them as an equal in your relationship. 2. Pay attention. Put down your phone, turn off the TV and stop updating your Facebook page while they are trying to talk to you. Sit and look at them and listen to what they’re saying without being distracted. This shows that you think what they have to say is important and that you are truly interested. 3. Remember the details. Did she mention in passing that tulips are her favorite flower? Did he rave about your moms chocolate chip cookies that one time? Remember these little details and store them in your memory for later. Then you can surprise them with little treats that you’ll know they love. They’ll be touched by your thoughtful gesture and be impressed that you took notice and remembered what they’re favorite things are. 4. Help out. Did they tell you that they couldn’t go out until they raked the leaves in their yard or walked their St. Bernard? Show up with a rake or a leash and offer to help out. You’ll have fun doing it together and the fact that you came to help out tells them how much you value your time together. 5. Do things for them just because. It doesn’t need to be Valentine’s Day or their birthday for you to surprise them with chocolates or to send them a text telling them that you think they’re awesome. Doing nice things on any old day shows that you think of them without needing a holiday or special occasion to remind you. 6. Touch. Find little ways to touch them while you talk, while you’re walking or driving together or just hanging out. This shows that you are crazy about them and want to find ways to be close, even if you’re just watching TV or walking around the mall.